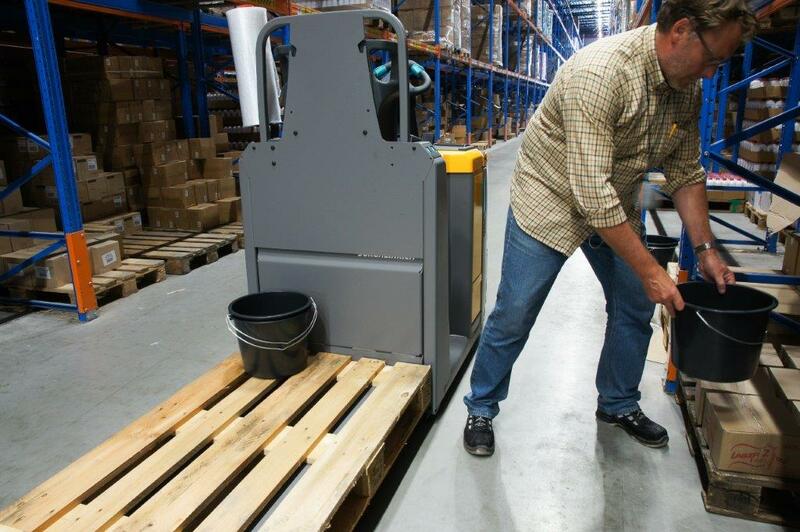 Order picking with remotely operated trucks is more efficient than riding the truck in almost every situation. 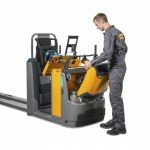 We have seen this in several tests and it is proven again by the Jungheinrich ECE 225 with easyPILOT. EasyPILOT works differently than existing systems, but the effect is not any less. 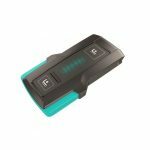 How do you use the easyPILOT and what are the first experiences? Our test points it out. 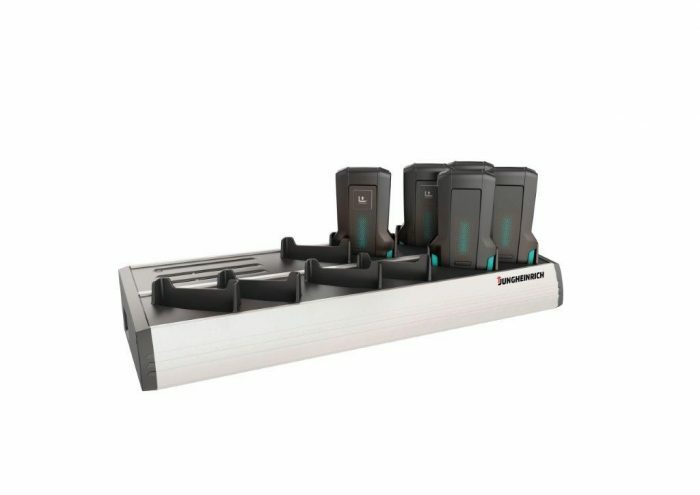 Several years ago, Crown caused a sensation with the launch of the Quick Pick Remote system, an order pick truck with remote control. 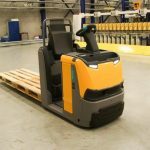 The system allows the orderpicker to walk along the truck, so stepping back on the truck and driving it, is no longer necessary. 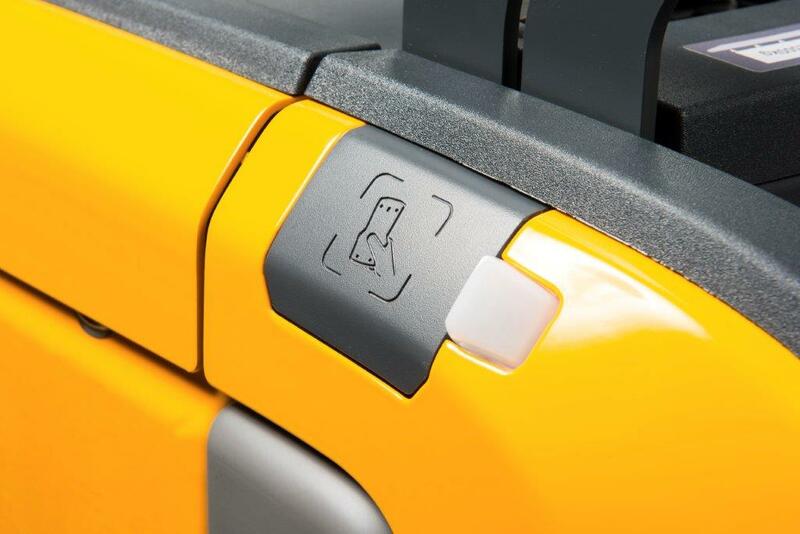 To move the truck forward, operators use a push button on a glove. 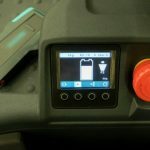 As the principle is patented by Crown other manufacturers are developing alternatives. 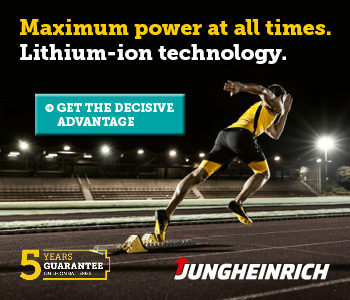 So did Jungheinrich. 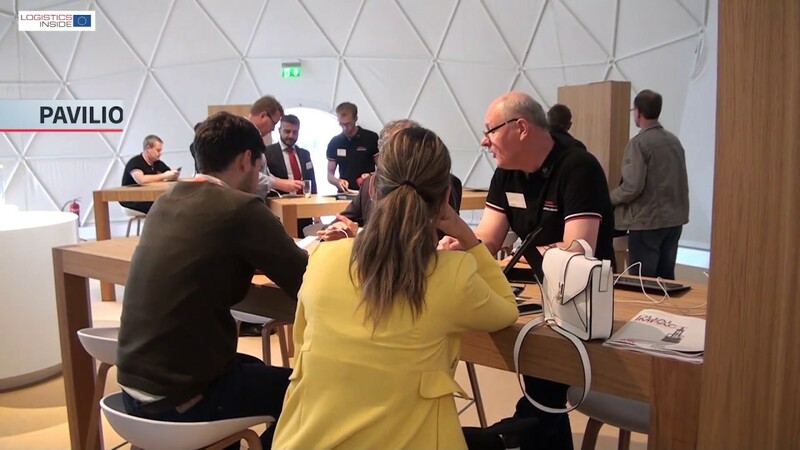 At CeMAT 2016 the brand demonstrated its easyPILOT concept with connectivity to the WMS. 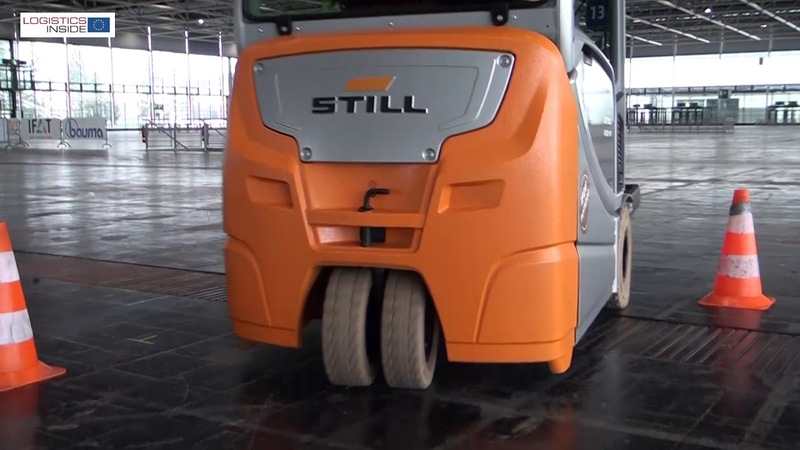 Some trucks are now used for tests with customers. We tested the system one day on our order picking track. The easyPILOT system consists of a Jungheinrich ECE easyPILOT truck and a remote control. 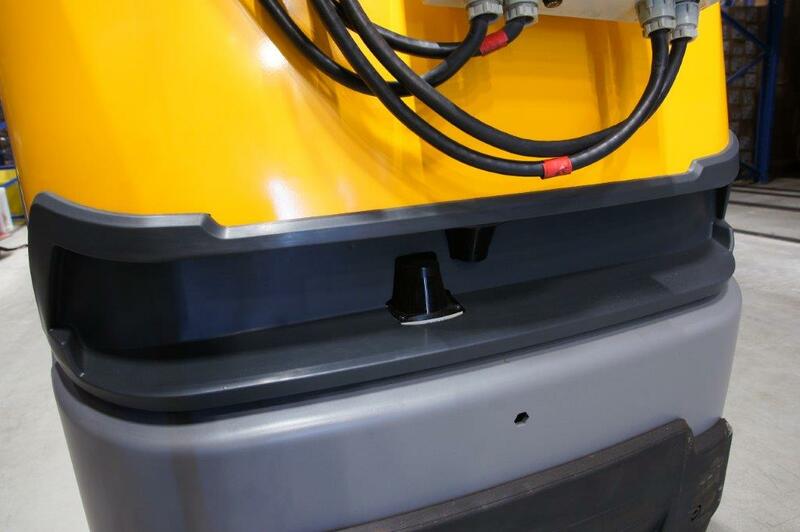 The truck is equipped with special electronics, software and a hood with two built-in safety scanners. The hood and software are easy to install, so the cost for retrofitting remain relatively low. 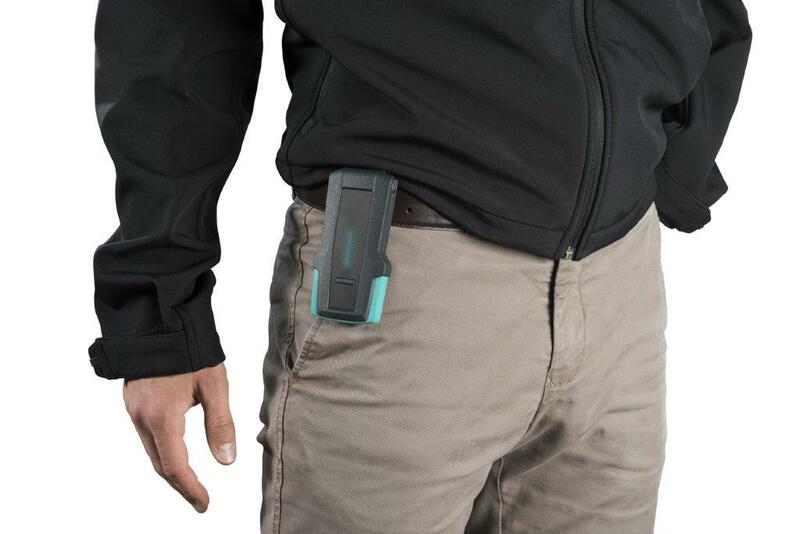 Heart of the operating concept is the transmitter which the order picker can attach to a waistband. 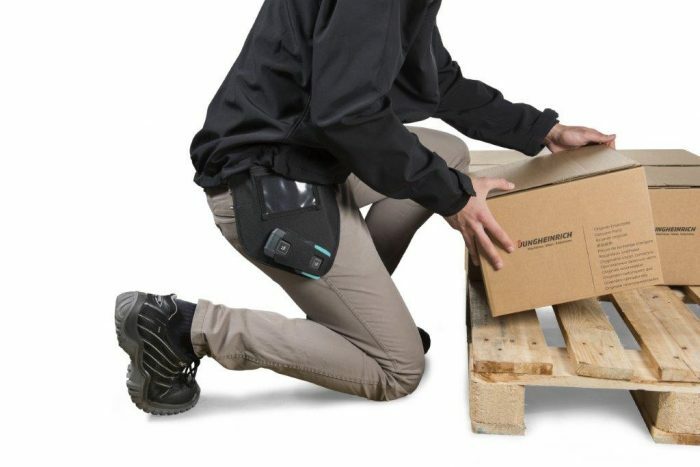 A holster is also available for both left and right hand operation. 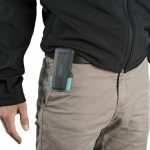 The remote control is equipped with a Li-ion battery that delivers energy for more than two shifts. 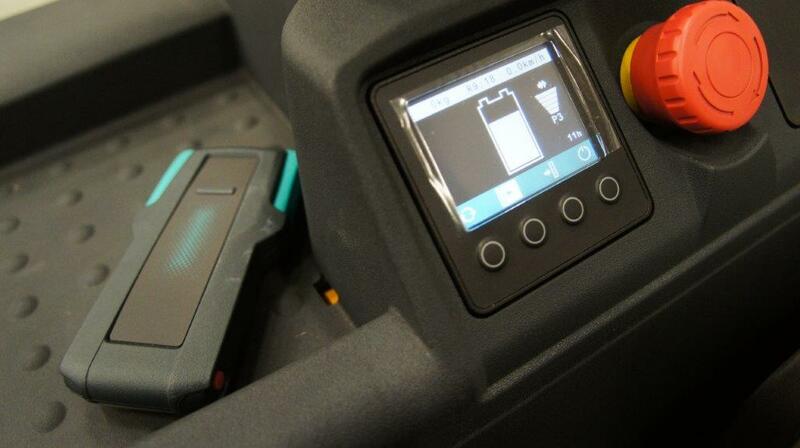 The low battery status warning will be displayed both on the truck as on the side of the remote control system (with a LED). Linking the transmitter to the truck is trivially easy. 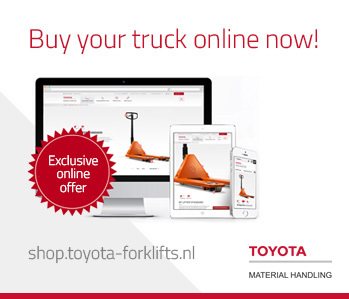 When switching on the truck the display reports that the link is possible by showing a symbol. As long as the link is not completed, this symbol remains visible. Pairing is executed by holding the transmitter briefly, approximately 1.5 to 2 seconds, on the coupling zone at the side of the truck. The attention LED lights on the truck blink to confirm the link and the symbol on the display disappears. The link remains active as long as the contact of the truck is turned on. 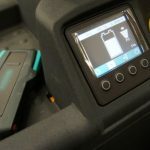 If the order picker has been outside the transmitter range, the system will automatically reconnect when transmitter and truck are within their communication range. Other remote units are not accepted in the meantime. 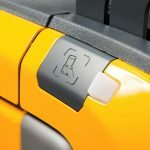 Operating the truck remotely is possible in two ways: either by simultaneously pressing the two side buttons on the remote, or by ‘tapping’ on the unit. 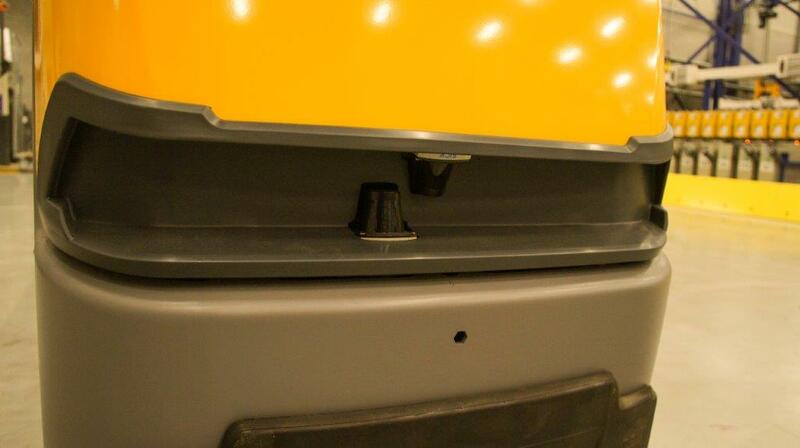 When the buttons are pushed, the truck drives up to 10 meters as long as one of the two buttons is pressed. 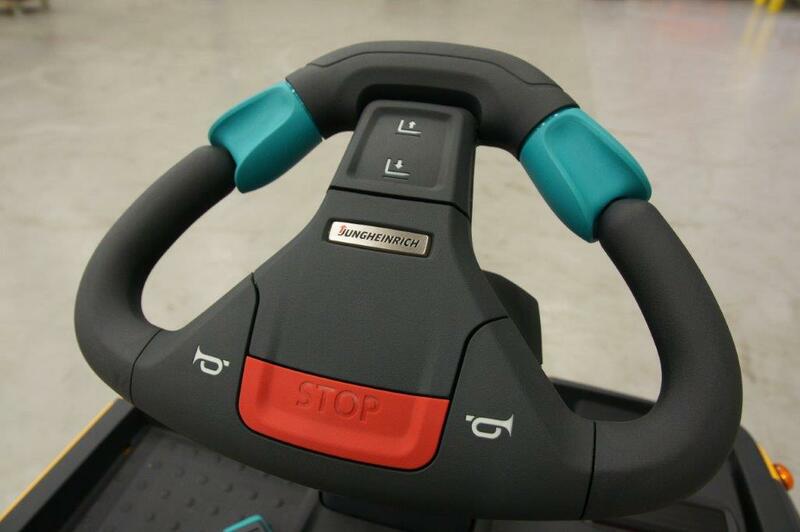 When tapping the driving distance depends on the pre-programmed settings. One can choose between tapping 2 or 3 times. Tapping twice results, with our test truck, in a driving distance of approximately 2 meters before the truck stops automatically. Tapping 3 times results in a driving distance of 7 meters. Each distance up to the maximum of about 10 meters is adjustable. Tapping the remote once stops the moving truck. There is also a stop button on the side of the remote. However, this does not work very convenient. If any function on the truck is activated, for example by turning the steering wheel, or pushing the pedestrian button on the side of the truck, the truck also stops moving automatically. Of course, this also happens when the safety scanners detect an obstacle. 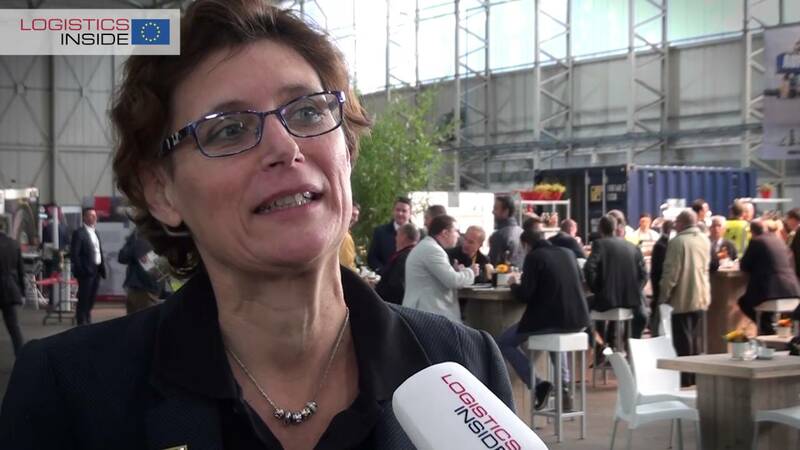 To find out how easyPILOT works we tested the system in the field. Unfortunately, the testing set-up in the warehouse where we could test the system, did not comply with our standard track layout. The aisles were considerably longer, which makes a pure comparison with existing data impossible. But we were able to see what the effects are when order picking with and without the system. During the test we kept the distances between the several picking locations as much as possible identical to the standard test set-up. However, the longer driving distances, due to the longer aisles, were a fact we couldn’t adjust. 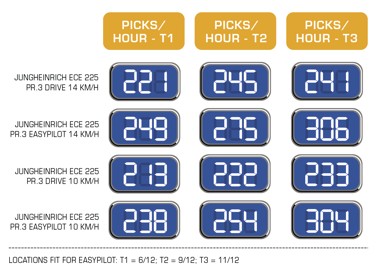 We tested the ECE 225 with and without using easyPILOT and we also varied the traveling speed, between the maximum 14 km/h and a slightly slower 10 km/h. 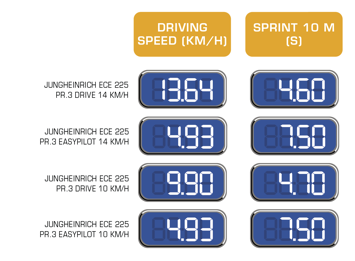 In both cases, the vehicle speed when using easyPILOT remains the same at 5 km/h. 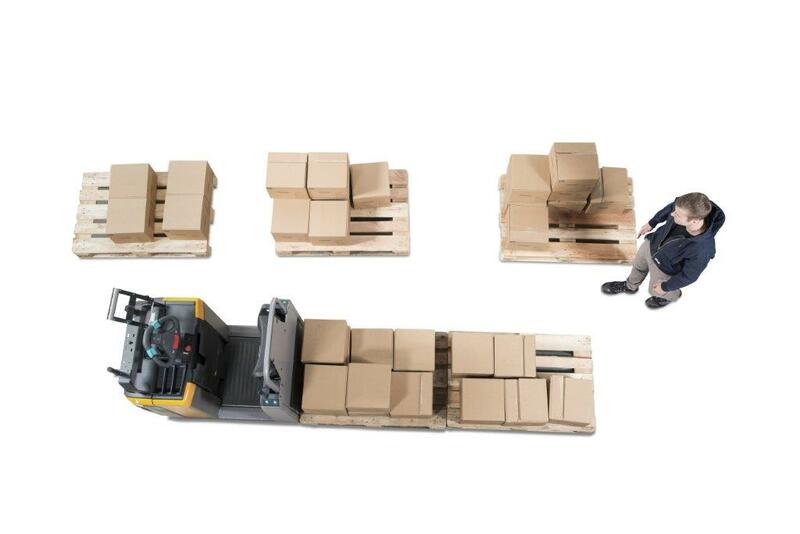 As with our standard test protocol, we used the truck at three different order picking routines. Each of them has 12 picking locations at which we always pick one item. 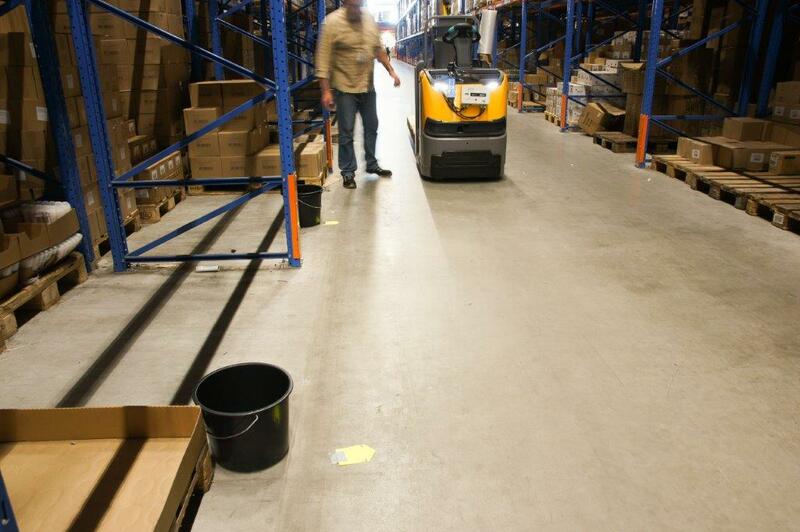 On track 1 the distances between the order-picking locations correspond to an average situation inside warehouses. On the occasions when easyPILOT seems to make sense, which is at a distance up to approximately 6 meters, we use the remote system. On track 1 it is possible to use the system on 6 out of 12 picking locations. On track 2 and 3 we reduce the distances between the stops so we can use the remote control 9 and 11 times out of 12. On all three tracks, the driving route and total driving distance remains the same. 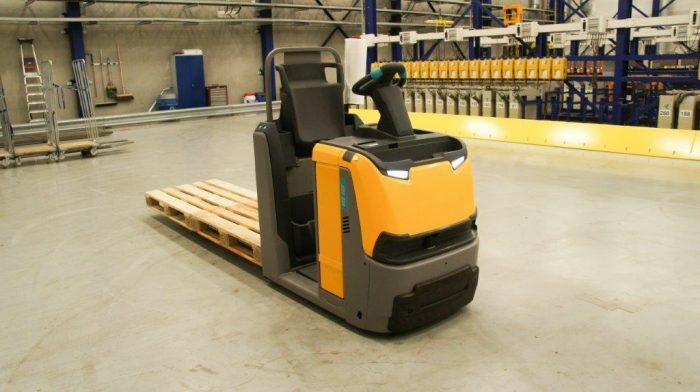 The results confirm the data we have already collected by using other remote operated order pick trucks. Even on track 1 the easyPILOT system provides a productivity improvement of 12.7%. This rises to over 30% within track 3 (with optimized quick pick zones). The profit results from the loss of time walking back to the truck, entering it, driving it to the next stop, stepping down and walking to the next order picking location. 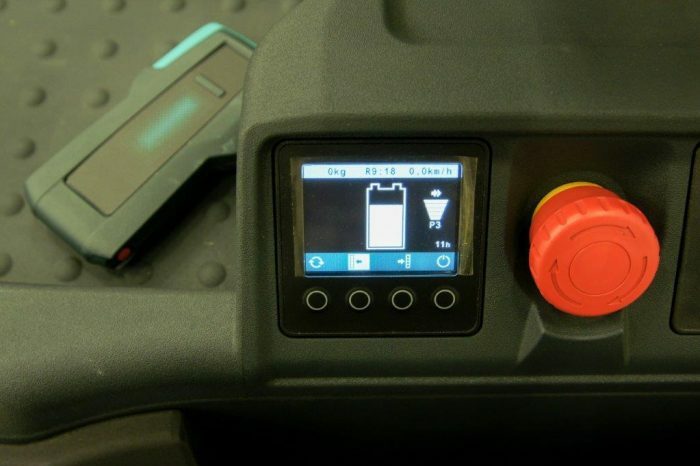 When using the remote easyPILOT system, power consumption drops by approximately 16%. Driving with 14 km/h only delivers a reasonable win at track 2 with 10% more productivity. On the other two courses the profit is limited to 3.5%. 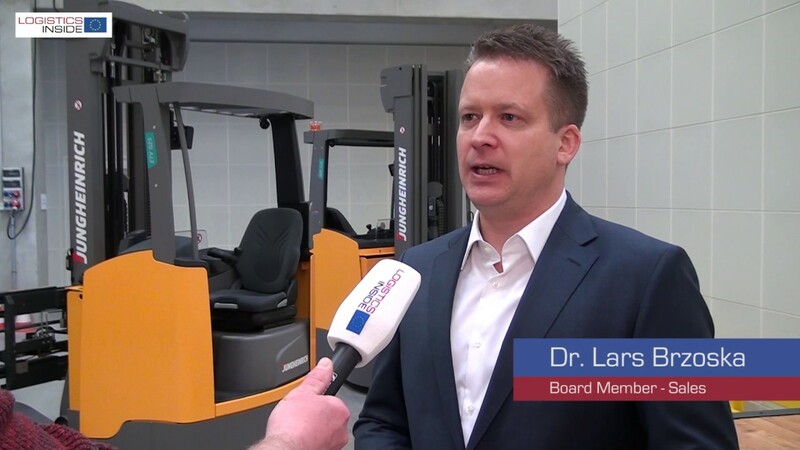 However, the costs to drive 14 km/h, run up to 20% more energy consumption. 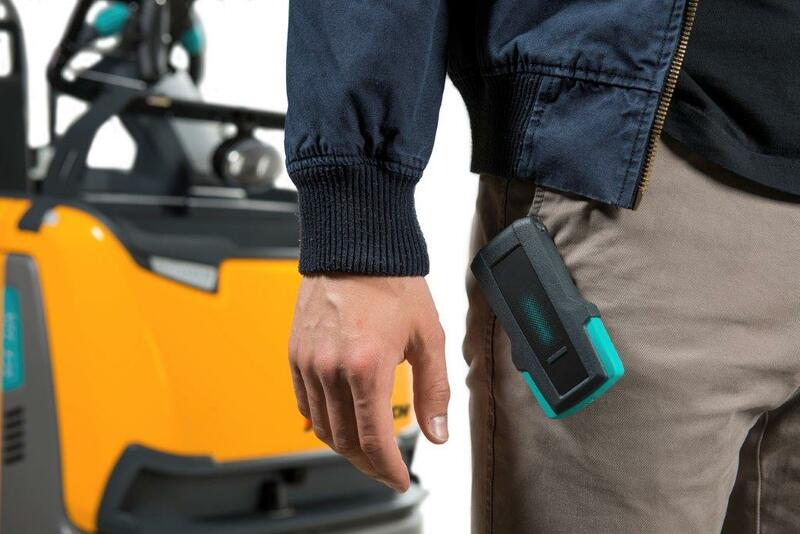 To make the most out of using Jungheinrichs easyPILOT you have got to get used to the system. Tapping the remote successfully requires some experience. When that experience has been achieved, the system is predictable, fun to use and delivers proven savings. 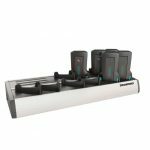 For optimal functionality, it is important to attach the unit at a comfortable spot on the body. That way tapping needs minimal effort. 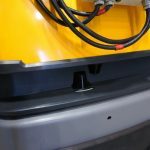 Nevertheless, we quite often experience a desire to adjust the position of the truck. Also, for this operation the pushbuttons are not that convenient in the opinion of the test team. 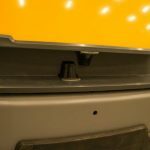 We recommend Jungheinrich to create a button that is easier to control or a special control system for this functionality. 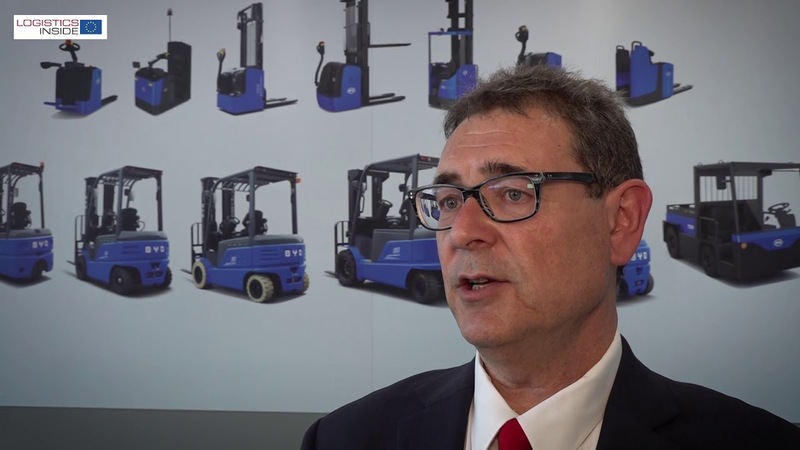 Furthermore, the possibilities for efficient order picking with remote control systems are limited to a distance between picking locations up to 8 meters. Ideally picking zones with distances between 2 till 6 offer the highest output. 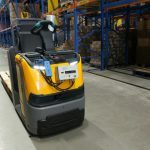 Quite ideal to optimize the order picking process is the live connection with the WMS. In that case the warehouse management system knows the exact location of the truck and the distance to the next picking location. 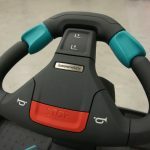 By tapping the remote the operator can choose whether he wants to drive the truck automatically to that location or rather choose a pre-set driving distance. 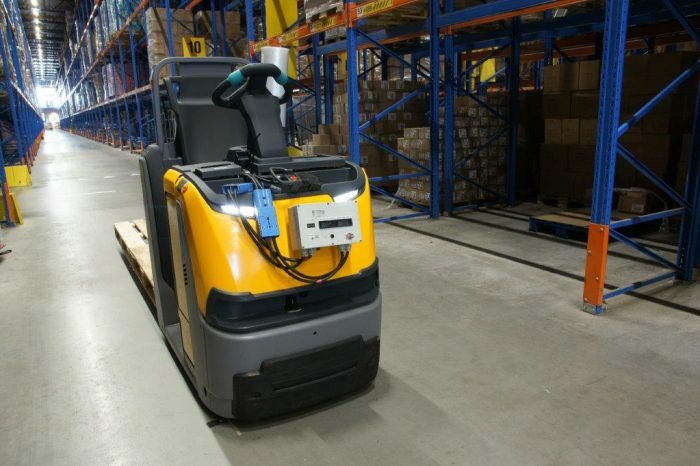 The easyPILOT truck orientates itself automatically into the aisle. The distance to the next stop is pre-adjustable and the aisle side can be selected via the display left or right. We used the system on three tracks with different distances between the picking locations. 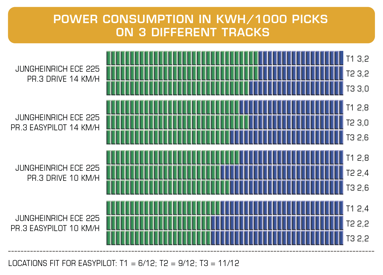 Conclusion: easyPILOT saves 12.7% up to over 30%, depending on the distances between the stops. The scanners are safely placed in the hood. When service is needed, the hood can be removed and the mechanic can work conveniently. 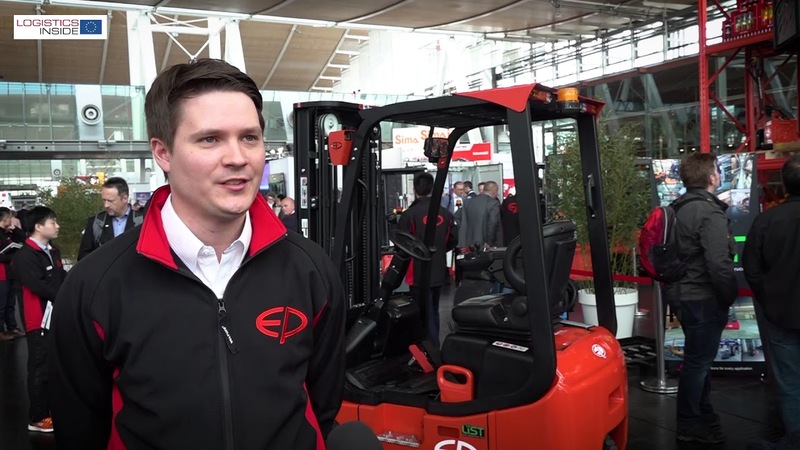 The Jungheinrich ECE 225 with easyPILOT confirms that picking is more efficient with a remote controlled truck. 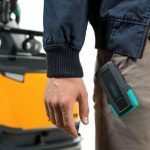 The remote control is equipped with a Li-ion battery which delivers sufficient energy for more than two shifts. Charging the battery is easy by inserting the unit into the supplied charger. 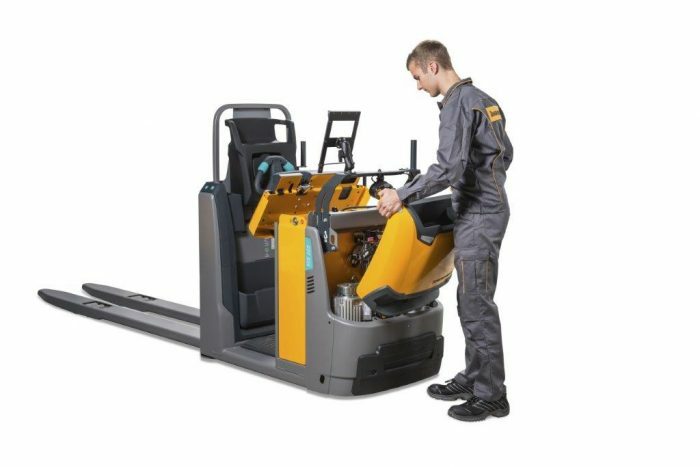 Jungheinrich provides a harness for the remote. Models are available for both left and right hand operation. 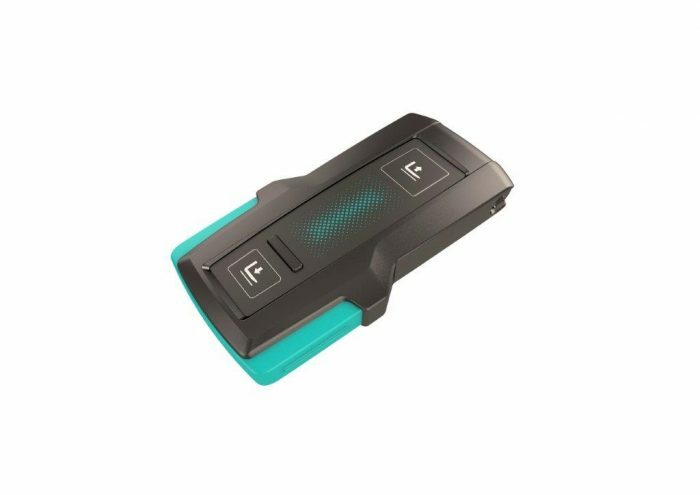 Pairing the vehicle and remote is trivially easy. Once paired, the connection remains as long as the contact of the vehicle is turned on.